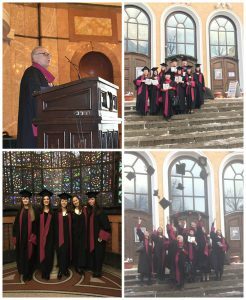 On an official ceremony in the ceremonial hall of Sofia university the diplomas of the graduating students in the faculty were bestowed. The ceremony was opened by the vice-dean of the faculty Assoc. Prof. Georgy Burdarov who emphasized on the graduation moment full of joy but also some sadness. The dean of the faculty Assoc. Prof. Philip Machev congratulated the students and wished them success and realization of their goals.